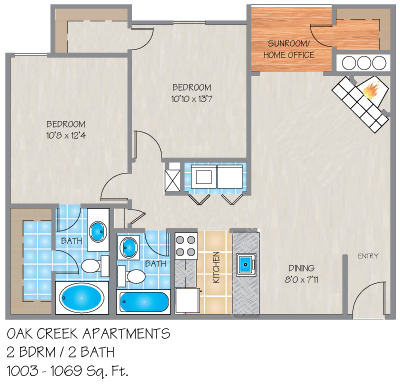 Please send me more information about Oak Creek Apartments. In this River Ridge, LA apartment community, our one and two bedroom apartments available for rent offer an array of amenities including washers and dryers, personal intrusion alarms, fully equipped kitchens, wood burning fireplaces, nine-foot ceilings, European soaking tubs and sunrooms with faux-wood flooring. Let yourself experience the ultimate in contemporary living in prestigious apartments in River Ridge. Oak Creek Apartments is the choice for those seeking a rural living experience with city convenience. The natural wooded setting amid majestic oak trees, landscaping, flowing creeks, lavish and cascading fountains, inviting pool and lighted tennis court all within a gatehouse entrance creates an atmosphere of tranquility and unique apartment living. Sit back and imagine the luxury of living in an elegant apartment home located within The Creeks of River Ridge, a gated garden community just minutes from work and play. Oak Creek Apartments is conveniently located to Downtown New Orleans, Elmwood Business Park, the Earhart Expressway, Huey P. Long Bridge, and Interstate-10. Our location is also ideal for individuals attending local area universities such as Tulane, Loyola and Xavier. During my stay for over six years at Oak Creek apartments. My stay there was awesome, I lived close to my office and there are a few great restaurants near by.If you want to downtown New Orleans its only about 10-15 minutes, airport about the same. My point is Oak Creek apartments is almost in the center to where you can go in any direction and get there quick and easy. Oak Creek is quite most of the time. One of the the most important things i will miss is the management team. I was always treated with respect and if i had any problems it was taken care of in a timely manner. I will miss Oak Creek apartment. But it's my time to move on with purchasing a new home. Oak Creek is an awesome place to live! I've been here almost a year and absolutely love it. The staff is nice and friendly, problems are handled quickly. The grounds are well maintained as is the pool. Friendly neighbors, spacious apartments that feel more like a home, and great prices. Convenient to lots of restaurants, shopping and Earhardt Expressway makes it easy to get to downtown. I highly recommend this property. The Creeks is like having your own little community. The most convienient thing about living their is easy access to any area in New Orleans. Driving to your favorite places is only 15-20 minutes away. Elmswood Fitness Center is 5 minutes away as is most shopping areas. Of you need a mall, that too is just 10-15 minutes away. Sams Club is within 10 min drive. Clean area, no crime, and traffic not that bad at all. The ladies in the front offices are very welcoming and easy to work with. Overall a great experience. Lived in Cypress Creek. Clean, quiet, well maintained, office and maintenance staff are excellent, good location, and surprisingly inexpensive. Nice pool and tennis court, but unfortunately no gym. Beautiful grounds. I looked a many apartments before visiting Oak Creek and I'm so glad I took the time to visit here because I found my new home. The apartments are spacious, the grounds are pretty and well kept, front office staff and maintenance staff are warm, welcoming, friendly and have become some of my newest friends. I have never encountered a delay in any maintenance being performed when requested and it is always done correctly. Neighbors are friendly. 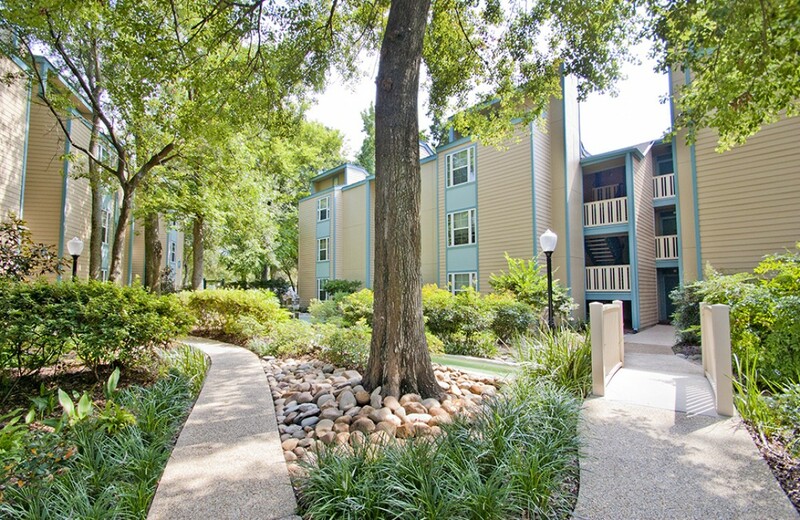 If you are looking for an apartment in a great and safe area, check this complex out!!!!! So happy in the Ridge I've been at Oak Creek for about 2 years and love it. The bonus sun room and storage closet add an amazing amount of square footage. I'm on the 3rd floor so my ceilings are high and make the place feel very spacious. I've only had two issues with appliances; both were reported in the evening and fixed the next morning. They pressure wash the outside of the building pretty often so there is no build up of spider webs, leaves, or bug nests. They are also very vigilant about trash or items left on the porches so it keeps the whole neighborhood looking very neat and nice. Great! The Creeks of River Ridge are great. I love looking out my window to the fountain in the courtyard. The closet space is everything!! The staff is phenomenal!! Oak Creek Apartments The apartments are very beautiful and the people in the office are very nice. Price is ok, for a one bedroom it is 852. You are paying for the area. Very good area. Haven't had any problems other then there's a lot of tress so it tends to get a few bugs in the apartment. I've been here over a year and really have no complaints. Every time we have had a problem they were right here to fix it. I am actually about to resign my lease because I love it here so much. They also have an alarm system and fire place that helps my girlfriend feel more comfortable and safe.